Logan McDonald finished one stroke off the medalist round among the boys and Caitlin LaCerra finished one stroke off the medalist round among the girls as they led their respective squads to top honors in a three-team nine-hole tournament at Hurricane Country Club on Thursday. McDonald shot a round of even par 36, second only to Benton’s Brenan Little at 35. But the Hornets scoring group finished a 154 to Benton’s 157. Sheridan combined for a score of 226. LaCerra carded a 44, to finish behind only Sheridan’s Emma Hester at 43. The Lady Hornets scoring trio turned combined on a 143. Sheridan was second at 151 with Benton at 169. For the boys, Clayton Harbour was just two strokes off the pace at 37. Daniel Taylor and Andrew Gaspard each turned in rounds of 40 with Landon Allison carding a 41. In addition, Cameron McDonald finished with a 43 and Brendon Morton shot 44. Ian Thrash carded a 46, a stroke ahead of teammate Caleb Barnes. Jimmy Cerutti shot 57 with Will Hanson finishing at 59. “Very good rounds by Logan and Clayton,” said Bryant golf coach Steve Griffith. Brooklyn Waller had the third best girls’ score with a 47. Meredith Medford shot 52 and Anna Barnes 58. Leighton Crawley finished at 61. 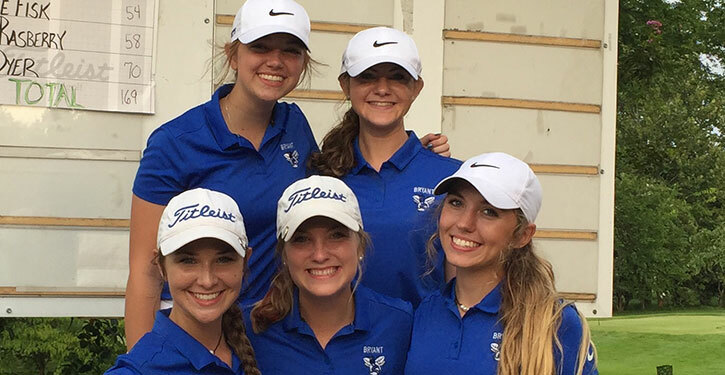 Bryant will play at Conway in a four-team 18-hole varsity match on Wednesday then both varsity and JV will play on Thursday against Benton and North Little Rock at Hurricane.